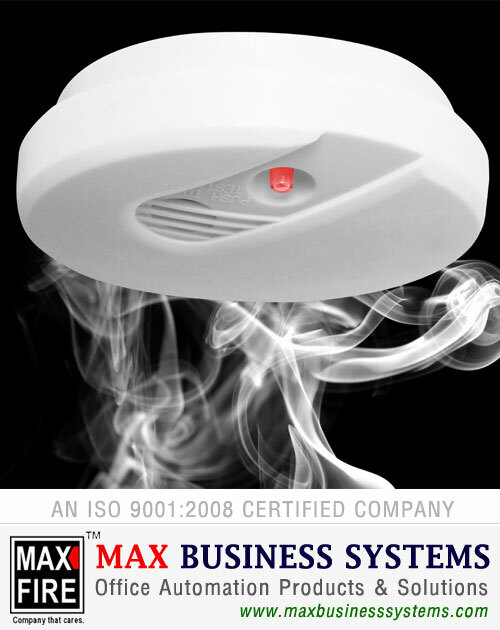 A smoke detector is a device that senses smoke, typically as an indicator of fire. Commercial and residential security devices issue a signal to a fire alarm control panel as part of a fire alarm system, while household detectors, known as smoke alarms, generally issue a local audible or visual alarm from the detector itself. Smoke detectors are typically housed in a disk-shaped plastic enclosure about 150 millimeters (6 ) in diameter and 25 millimeters (1 in) thick, but the shape can vary by manufacturer or product line. Most smoke detectors work either by optical detection (photoelectric) or by physical process (ionization), while others use both detection methods to increase sensitivity to smoke. Sensitive alarms can be used to detect, and thus deter, smoking in areas where it is banned. Smoke detectors in large commercial, industrial, and residential buildings are usually powered by a central fire alarm system, which is powered by the building power with a battery backup. However, in many single-family detached and smaller multiple family housings, a smoke alarm is often powered only by a single disposable battery.